We know you like us at full price – but you will LOVE us at 60-70% OFF!! 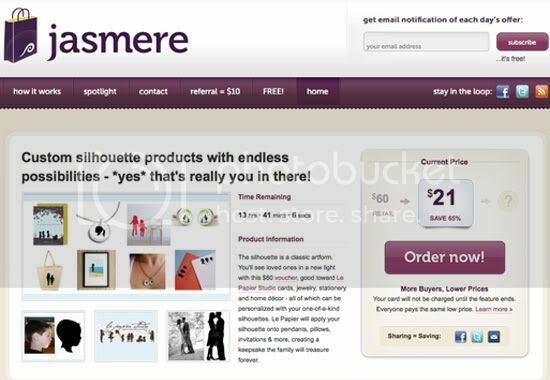 We’re teaming up with Jasmere to offer you an INCREADIBLE deal – a $60 voucher good towards Le Papier Studio cards, stationery, jewelry, home decor and much more. It’s easy : you place an order with Jasmere than spread the word (via Twitter, Facebook, Blogger , email or the good ol word of mouth) about this amazing deal. The more people shop, the more the price goes down. No credit cards are charged until the end of the sale – which guarantees you the lowest price. Remember – only 14 hours left – ends at 12 PM (ET). So head over there now to take advantage of this increadible deal. As always, thank you for supporting Le Papier Studio. The post 24 Hour Special appeared first on Le Papier Blog.